For my mama’s birthday I just knew I wanted to make her a quilt. It was a big milestone birthday and it deserved to be marked with an extra-special gift. And a party in the back. I was determined to branch out from my regular chevron pattern, but (1) I found these two gray fabrics and fell in love, and (2) it’s already getting hard for me to get up and down off the floor, and I’m getting pretty fast at whipping out chevron patterns and don’t have to do as much work on my hands and knees laying out patterns. I have a feeling the more pregnant I get, the less time I’ll be spending crawling around on the floor. 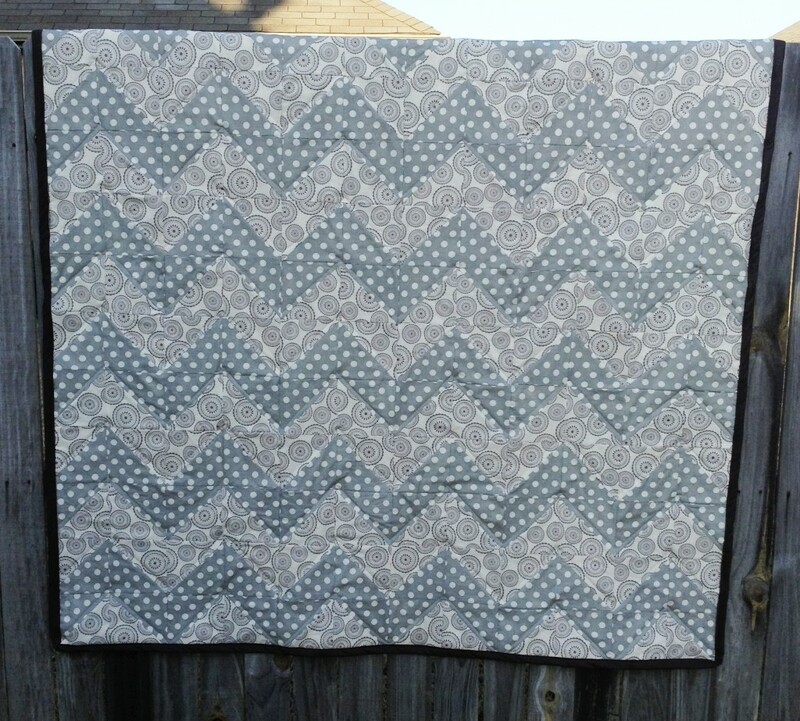 Which means Baby Girl may be getting a chevron quilt too (which would be fitting, because it’s my favorite pattern). I quilted a straight line along the zig-zags to make the pattern pop. I bought the fabric at my new favorite quilting store, Cabbage Rose in Fort Worth, and it’s so unbelievably soft. And gorgeous. Mr. Right talked me into buying the crazy floral backing, and I’m now so in love with it that I may use some of it for the nursery. He’s good at making me branch out of my comfort zone like that. Later this week I’ll post about the party we threw my mama for her big birthday. In the meantime, happy birthday mom – I love you! And I can’t wait to get back to my sewing machine for the next project. I use triangles which are really easy–you use the same method for pinwheels too, it’s just all how you arrange them. Look it up on YouTube–that’s how I learned it. thanks! i have only tried using squares. I think you did a great job. Love those two greys together. And the back is a hoot. Beautiful work Bethe! I am drooling over that floral print. Perfection. 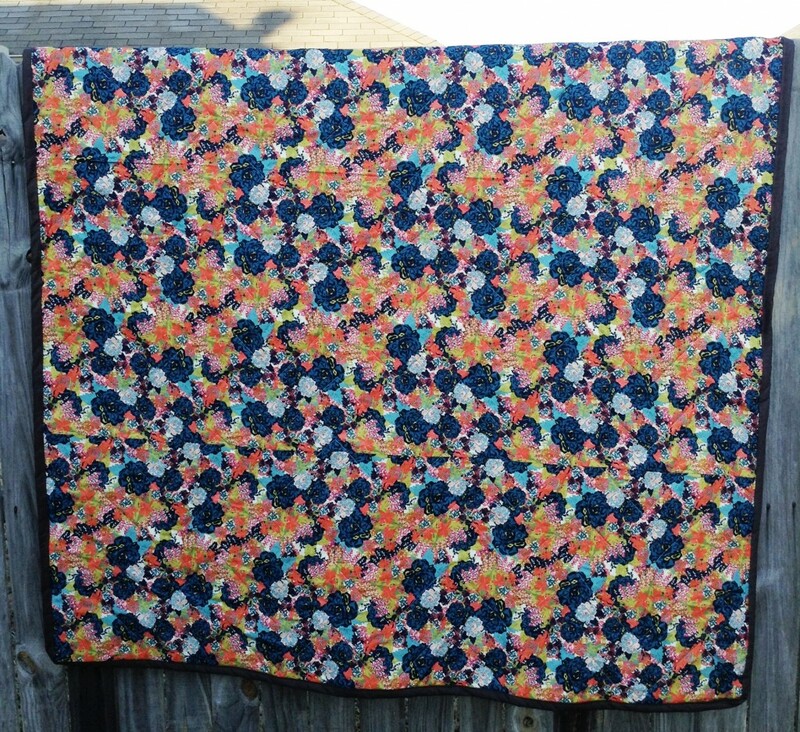 The name of this post is hilarious…and the quilt is beautiful! So glad you felt well enough to whip this out. I can’t get over the back! What a contrast! So good you were able to whip it up so quickly, especially while carrying around a little one to come! I never would have picked such crazy fabric on my own, but I’m glad Mr. Right talked me into it. Katie, that will be me soon. I’m wondering if I can sweet talk my husband into getting on the floor and basting for me when I get really big. He’s just sweet enough to do it. Congrats on your baby! 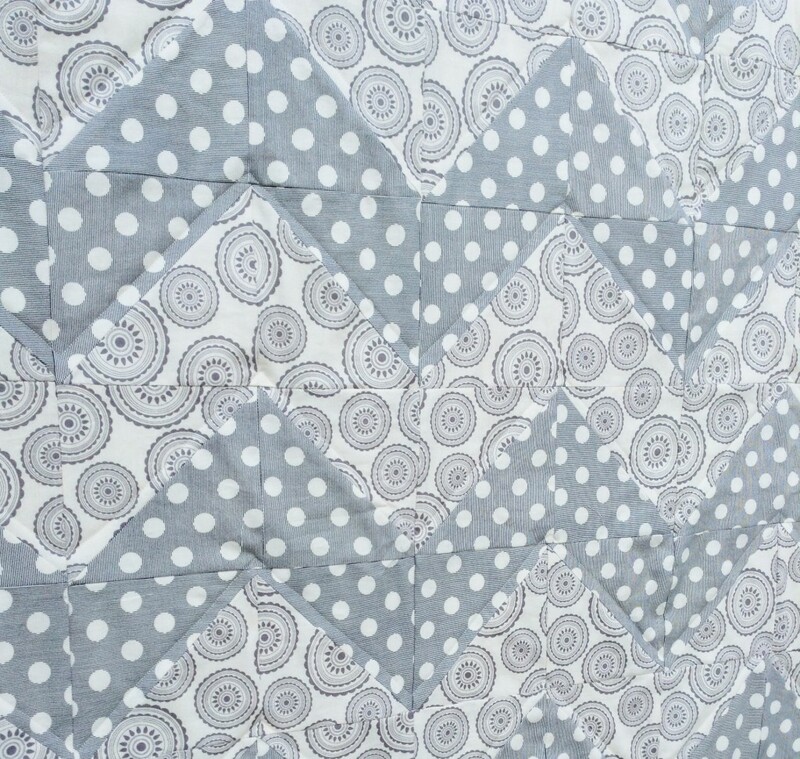 Love the neutral quilt, but especially love the name! Great job! I have four wonderful amazing children ranging in age from 27 to 18. I had horrible nausea with all of them, and want to let you know that every day of that nausea has been paid back to me tenfold!!! I know its a tough time to get through, but it is more than worth it, and one day you will look back on those days with fondness. Really! Enjoy every day of your pregnancy. 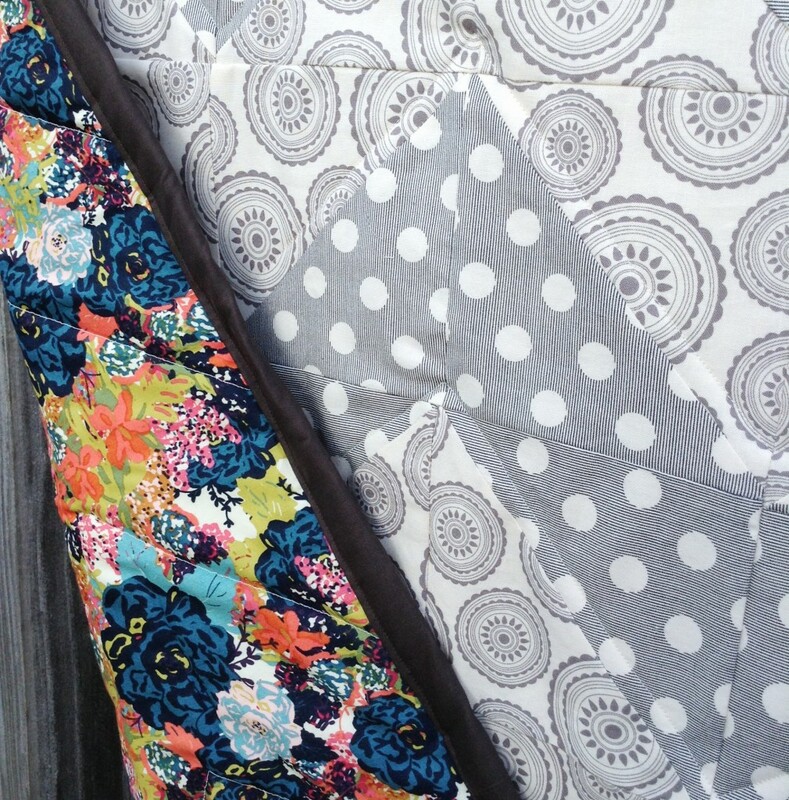 The quilting will be waiting for you when you’re feeling up to it!